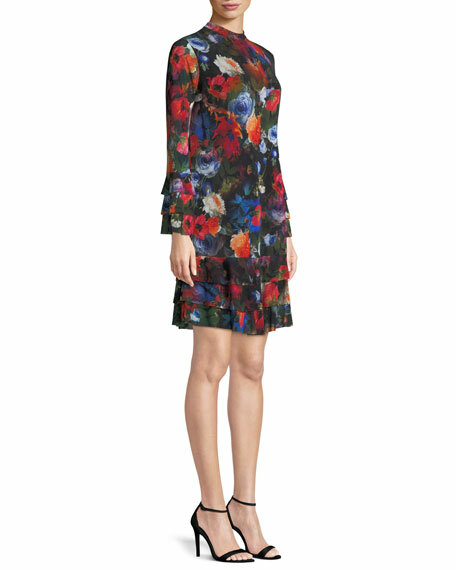 Fuzzi dress in floral-print tulle mesh. 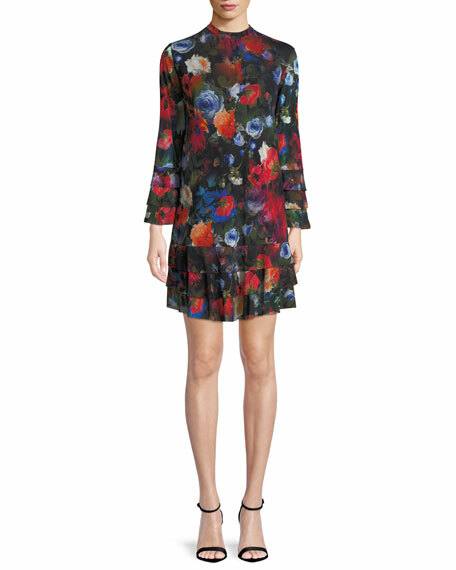 Alice + Olivia "Glynda" dress in floral printed chiffon. Crew neckline; self-tie/keyhole front. Three-quarter sleeves; cold shoulders. Shift silhouette. Hem hits above knee. Tiered ruffle hem. Pullover style. Shell: viscose. Combo 1: silk. Combo 2: viscose. Lining: polyester/spandex. Made in USA of imported material. 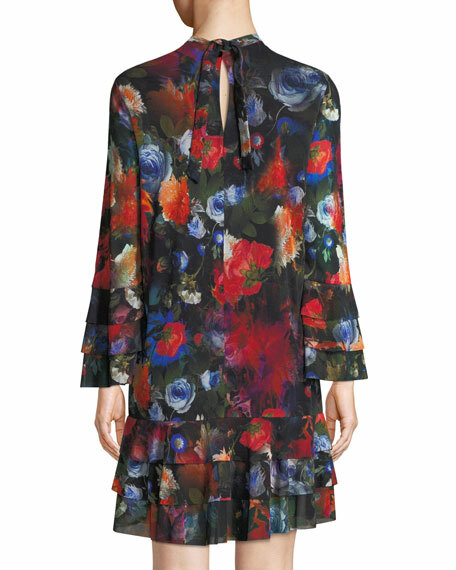 Coach dress in sheer rose-print silk. Ruffled crew neckline; keyhole front. Long sleeves; velvet ties. Fit-and-flare silhouette. Hem hits above the knees. Side zip closure. Polyester lining. Dry clean. Imported. Model's measurements: Height 5'10"/177cm, bust 33"/84cm, waist 25.6"/65.2cm, hips 35.8"/91cm, dress size US 2-4/FR 34-36. La Maison Talulah "Dahlia" floral-print dress with ruffle trim centered at chest. Sweetheart neckline; button-keyhole back. Long sleeves; button cuffs. La Maison Talulah "Dahlia" floral-print dress with ruffle trim centered at chest. Sweetheart neckline; button-keyhole back. Long sleeves; button cuffs. A-line silhouette. Mini length hem. Hidden back zip. Silk/linen. Imported. Loveshackfancy dress in floral-print silk. Approx. 33"L down center back. Split neckline may be worn open or tied. Long sleeves. Loveshackfancy dress in floral-print silk. Approx. 33"L down center back. Split neckline may be worn open or tied. Long sleeves. Smocked waist. A-line silhouette. Tiered, pleated skirt. Mini length. Slipover style. Imported.